The Om Reunion Project organizers were in touch fairly late in the game looking to rent a structure for their 2012 festival. After some discussion it became evident that a quick, inexpensive, and simple introductory structure would serve Om far better than renting some plain jane tent. 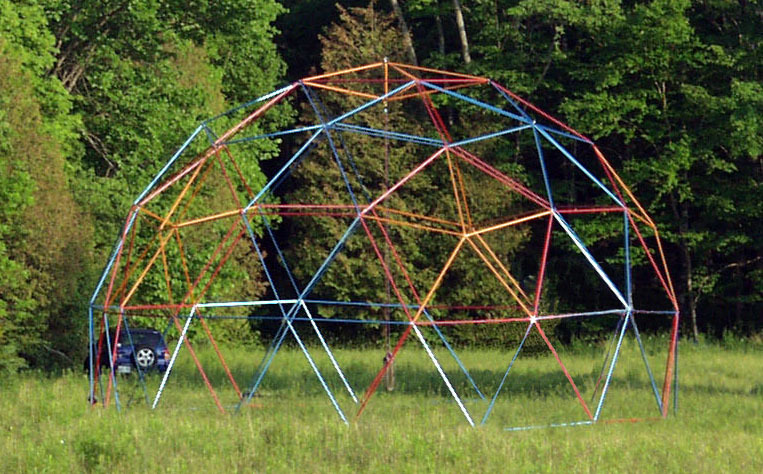 One idea they had was to proceed with a low frequency geodesic dome. After some optimization estimates they decided that a 47’D 3V 5/8 geodesic would suit their immediate needs quite well and worked within their budget. After some careful planning and schedule coordinating a plan fell into place. Materials were quickly sourced and ordered and we hauled the manufacturing tools to the festival site. On June 9, just a week or so after initial discussion, We all congregated on site for component fabrication. Within a 6 hour period the Om crew helped set up the production line and manufactured all the components for the structure. Footage of the fabrication process to follow soon. 9 days later, on the first day of the week long festival, all the remaining logistics were sorted out and the structure assembly began mid day. By the early evening the assembly was completed and a temporary swing installed to celebrate the completion of the newest addition to The Om Reunion Project. Footage of assembly and swinging to follow.